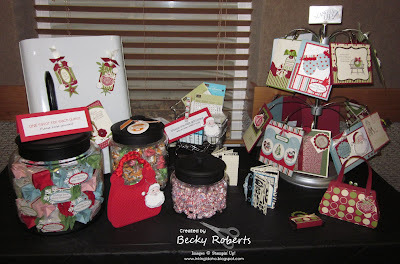 Candy Cane Christmas Stamp Camp was Saturday. 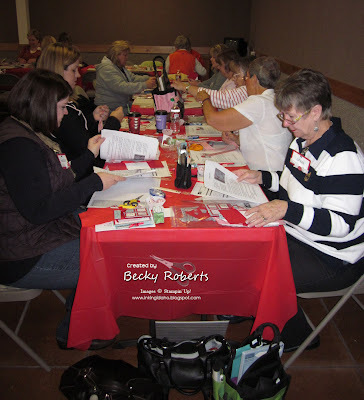 Thank you to all the ladies who took time out of their Saturday to stamp with me - it was a great day!! Projects for the day. 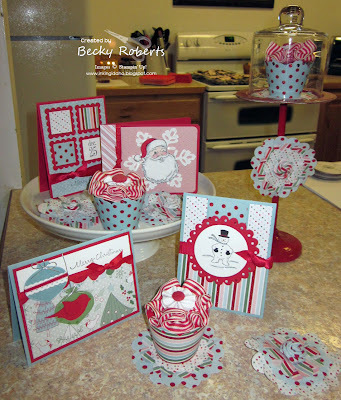 They made 4 cards, one cupcake and a fabric piece to use as a coaster or a pin. Lots of displays to look at. I love these cupcakes! 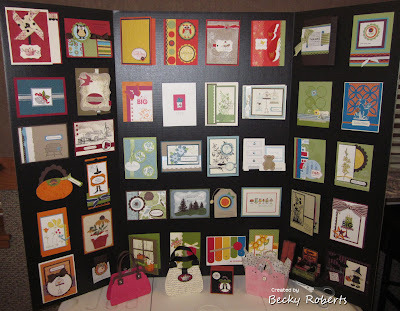 They are so easy to make and were the favorite project of this stamp camp. If they registered a friend, they received a gift. 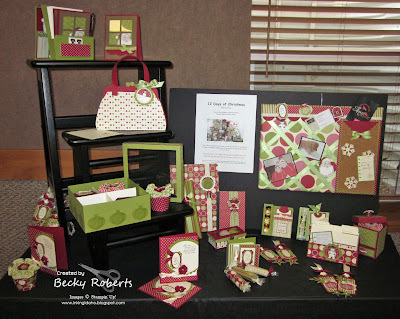 The pattern is available in the 12 Days of Christmas 2010 Edition if you would like to make one for yourself. These are my new friends Linda and Patrice. 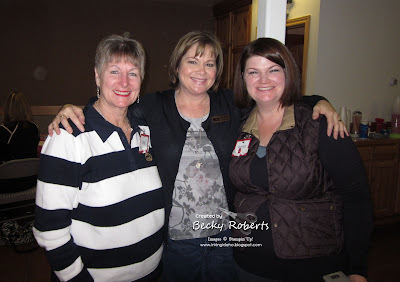 Linda lives in Oregon but was in town for the weekend, so she picked up her friend and joined us! It was nice to meet you both!! 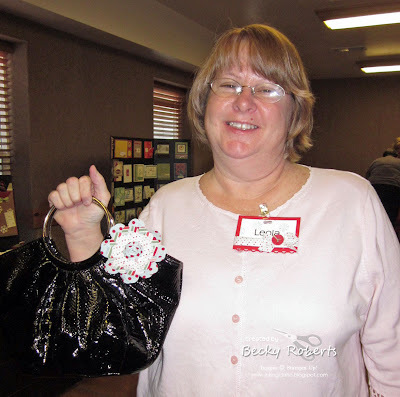 Leola used her fabric pin to decorate her purse. Pretty cute! 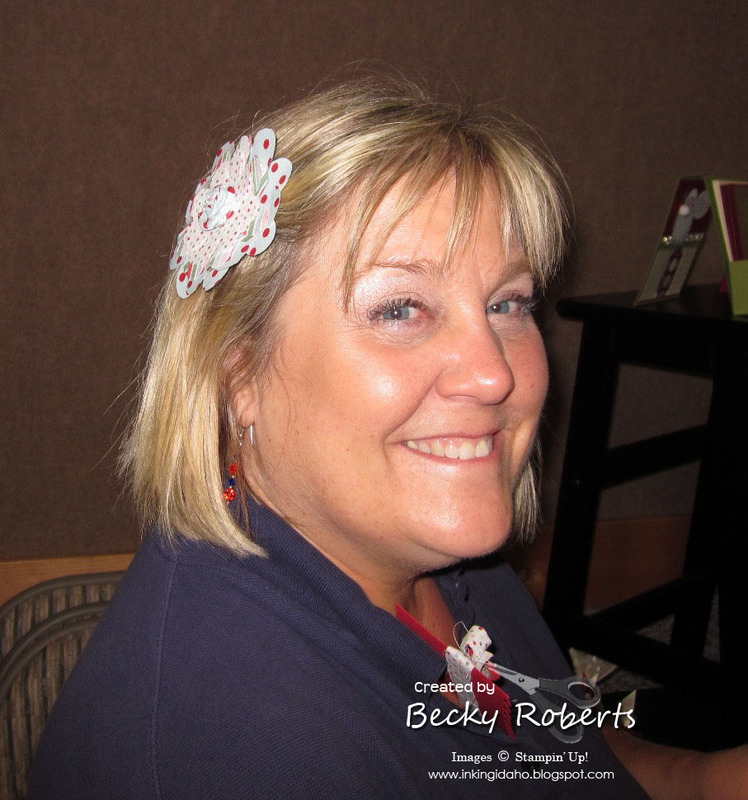 Our lovely model Teresa, adorned her hair with her flower pin. Girls just a wanna have fun...and that is what we had!! ABC's of the Perfect Handmade Holiday Promotion is still going on. Click HERE for all the details and see the special priced holiday bundles below. 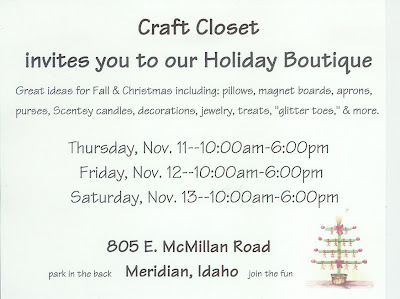 If you are in or around the Boise-Meridian area, stop by this craft show. It is one of my favorite ones in the area!! What did you use for the centers of the fabric pins? Too cute! Becky, great projects! 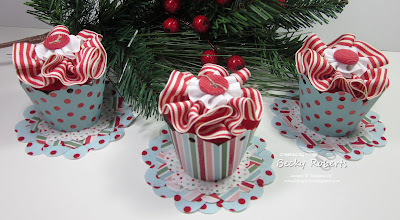 Is there a tutorial or any basic instructions available for the ribbon cupcake? I wish I could have been there. Reminds me of Catalog Kick-Off in Roseville and Suzie. I love all the projects you did and I think your tutorials are great. 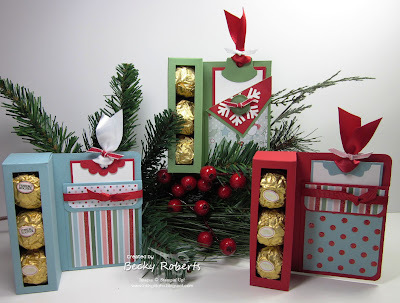 I just posted a project on my Blog(http://ihaveprettierstuff.blogspot.com/) that I did using the Elastic Page Marker from 12 Days of Christmas tutorial that I bought last month. 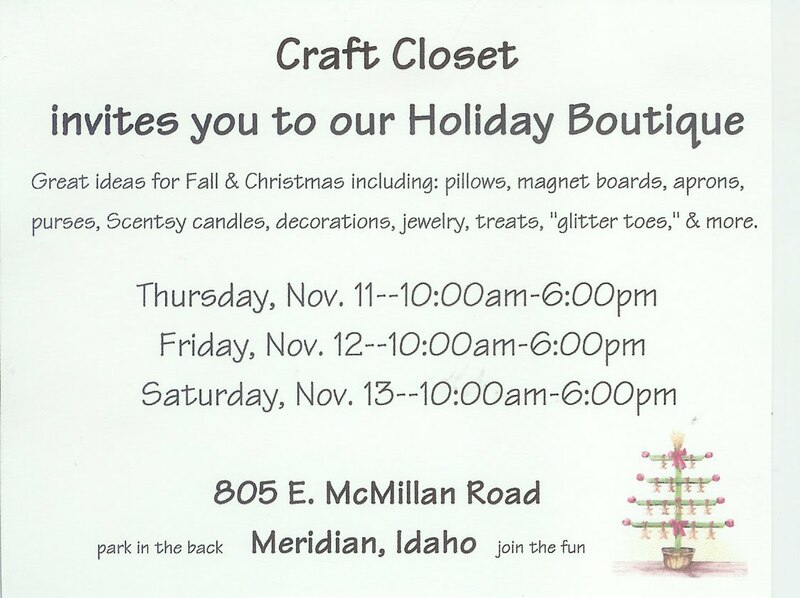 Hope you have time to check it out. Thanks for the insperation. Oh Becky - how I wish you were in the corn state and not the potato state! 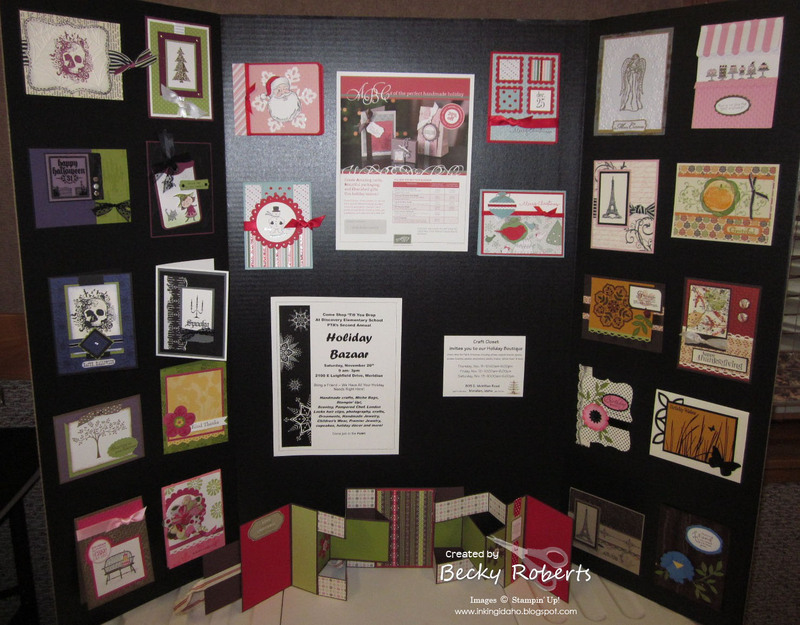 I would love to come to your workshops! Is there a tutorial on the pins and the darling cupcake? I don't think I see them pictured in your tutorial package which I hope to get soon. Everything looked like so much fun! Everything looks fabulous. I'm sure your day was huge success.